Johnston County will host its 5th annual Walk, Saturday April 27, beginning at 8:30 am at its new location in Selma! 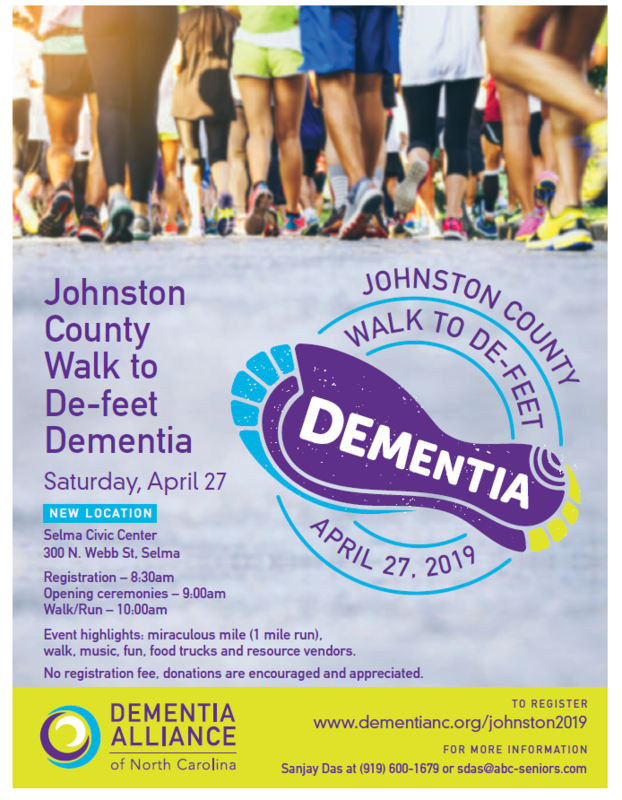 Please join us as we Walk to De-feet Dementia to benefit Dementia Alliance of North Carolina (formerly Alzheimer’s North Carolina)! We walk to raise awareness in the community, bring education to the community, raise funds critical to carry out the mission on Dementia Alliance, to honor and remember and to have fun! The event will include a Walk, Miraculous Mile Run, vendors, food, music and fun! Please contact Sanja Das for sponsor/vendor information and event details! Sanjay Das, Event Chair, (919) 600-1679 or sdas@abc-seniors.com. You can also visit www.dementianc.org/sponsorjohnston2019 for sponsorship details!